Despite Nico Rosberg qualifying a slightly disappointing fifth and Michael Schumacher failing to make it out of Q1 in Bahrain, Mercedes team principal Ross Brawn still believes that his team can be a major factor in the race. Brawn explained that with Schumacher it was not a simple case of being caught out by an unexpectedly quick Q1 from Heikki Kovalainen as he tried to save a set of soft tyres. Schumacher would have started the race 17th after a changed gearbox grid is applied to Pastor Maldonado but we understand has a gearbox issue of his own and may therefore have to come through from 22nd. "Michael had a DRS problem," Brawn explained. "DRS in qualifying , where you can use it for the whole lap, is worth more than a second. And so it didn't seem worthwhile burning a set of soft tyres when, from our calculations, we'd struggle to beat the time that we had already done. "It was frustrating that the DRS failed on the back straight going into Turn 11. I think we'd have been quite comfortable. We did have a think about going out on another set of softs but probably all it would have done was put us one place further up the grid." Brawn added that with the added complexity of rear wings these days, changing it would have been a 45 minute job as the floor needs to be dropped, and the team would not have had the time to right the problem before Q2. "Michael having all those new tyres will give us an opportunity to have a decent race," Brawn asserted. "His starts have been pretty impressive and with all the new tyres we've got more latitude. There was a fairly heavy consumption of tyres from everybody during qualifying, so we remain optimistic." It will be remembered that Mark Webber made it onto the podium in China last year, very much in touch, after starting 18th. 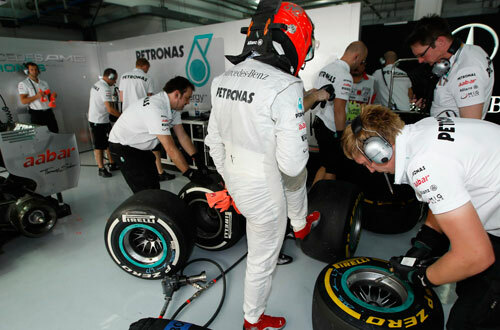 Rosberg too, used only a single set of tyes in Q2 and Q3. "Maybe that was asking a bit too much in Q3," Brawn conceded, "but he's got a new set of softs left for the race, which I think will be very important. We were debating how many positions we would concede by keeping one set of tyres and figured it was actually worth a couple of positions, but we gave up more than we thought! But I think we'll still have an interesting race. We think this is one of the circuits where the advantage of fresh tyres could be significant."